Booja Booja are the raw company behind and divine, flavoured truffles (£1.79), available in Wholefoods. 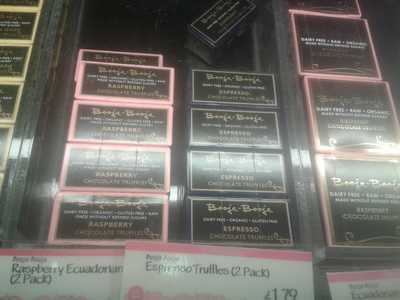 You can buy these particular truffles in every WholeFoods, they are delicious. Dairy, free, vegan and raw, the flavoured truffles are one of a kind. They're presented in a simple, uncomplicated box of chocolate-joy. The truffles are generously sized, rich and full of flavour, so don't that there's only two in a pack. I tried the Raspberry Ecuadorian and Espresso truffles. The raspberry ones weren't as sweet as I had expected, but surprisingly, the espresso ones were my favourite. They had just enough coffee to give you a little kick, much needed after a long day at work. If you are interested in trying dairy-free chocolate, Booja Booja is one of the best independents in this niche market. The quality of chocolate is also exceptional. I'm a big fan of independent chocolate companies and Booja Booja is one of the best.